I’m still learning a lot about Fireflame’s I Keep Having This Dream, and an by no means a pro. But I thought I would compile some things I’ve learned from playing, as well as some tips that might help others. I’ve nearly made it to the fourth world, with a high score of 870. This is a work in progress that I’ll be updating as I think of more to add. If you have your own tips you want me to include in the guide, feel free to leave a comment. Tiles: Each tile forms a section of a path. You hold five tiles at a time. To use one, drag it from your hand to the board. Then, use the green arrow to rotate it so it connects to the path the way you want. Exits of a path need to meet other exits. They can’t connect to the empty space in another tile. Keep this in mind, because if you build yourself into a corner and can’t fit any new tiles on the board, you’ll have to summon the Nemesis to eat up the path and allow you to continue. The Nemesis will gain some experience from this (more on that later). Compass: When you tap and hold a tile in your hand, the compass will appear on the map. It shows you the direction towards the exit and how many tiles it would take to get there if you go in a straight line. Attack Tile: Placing an Attack Tile will add that number to your total attack points. I have not seen any cap yet. According to the game, you lose 1/3 of your Attack points for every Snag attack. Defense Tile: Placing a Defense Tile will add that number to your total defense points. I have not seen any cap yet. According to the game, you lose 1/2 you Defense points for every Snag attack. Heart Tile: Placing a Heart Tile will add that number to your health until it is full. You can increase your health cap by leveling up your health. Gear Tile: Gear Tiles are used to earn new equipment (or gear — get it?). You can place gear tiles anywhere, but you will only earn gear points (or Control) if the tile is placed on a spot with a gear on it. You can only see which spots have gears by tapping and holding a gear tile in your hand. Once you build up 10 Control, you’ll be able to choose an equipment upgrade. Snag: Snags are the monsters of the game. A basic snag has a number of attack, health and defense. Tap on the Snag in your hand to see a red number and a blue number. 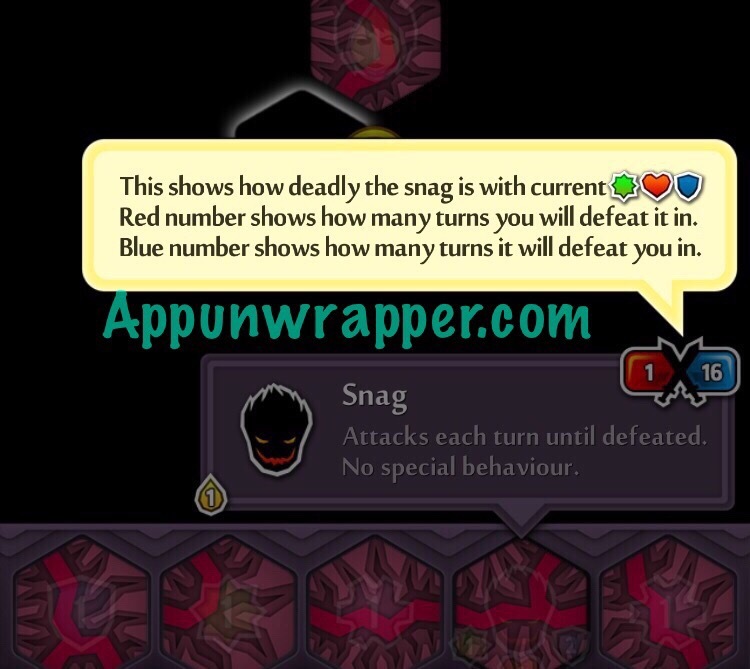 Red represents how many turns it will take you (with your current stats) to defeat the Snag and blue represents how long it will take the Snag to take your health to zero. 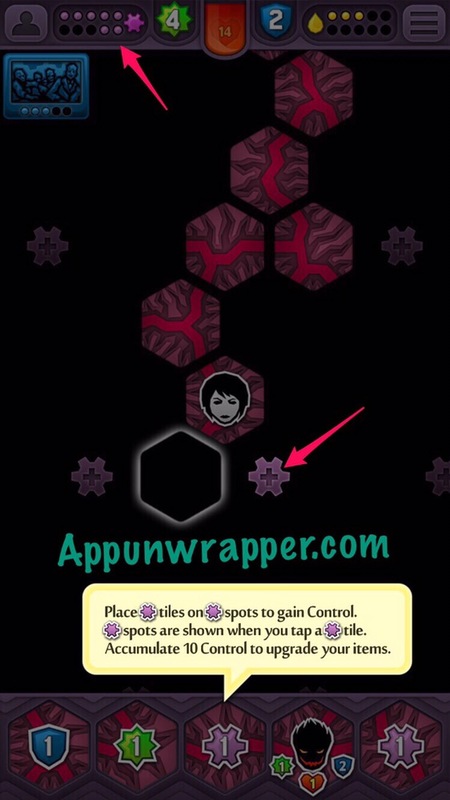 Basic Snags can be discarded using the X in the upper right corner of the screen. Special Snag: Special Snags come in many different varieties with many different skills and abilities. They can’t be discarded normally and they can cause you a lot of trouble. But some can also be used with perks to your benefit. 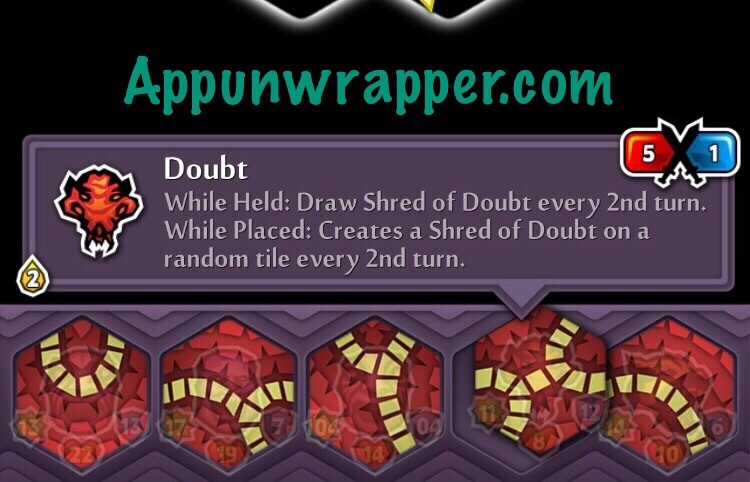 For example, the Doubt card summoned a weak Shred of Doubt for every other turn that Doubt was in my hand. Together with the Confident perk that gives +2 attack for every Snag killed, along with the Balanced perk that gives a defense point for every move my attack is higher than my defense, and the Doubt ended up helping me a lot more than it hurt me. Nemesis: Aptly named, your Nemesis is always behind you, and will end your game if it catches up to you and consumes you. When you kill a Snag, a little yellow droplet will appear on that tile. When you make it through a world’s exit, the Nemesis will follow your trail, picking up all the droplets for you and giving you the experience points. 10 droplets collected will cause you to level up. The catch is, if you discard a tile, the Nemesis moves forward the same number of tiles as its level and earns the experience along with you. As it levels up, it becomes more powerful. If your health reaches zero, the Nemesis moves all the way to the next droplet, one for each of the Nemesis’ level, and devours them — that means he gets the XP and you don’t. If you build yourself into a corner and get a red X, you can summon the Nemesis to eat up the path, allowing you to continue, but also consuming all the experience. You can also try to discard tiles until you get one that fits, if you think that’s likely to happen. It’s best to keep the Nemesis from ever moving, but the further you get, the less likely that will be. Discarding tiles has the smallest effect on the Nemesis and XP loss, so try that before risking losing all your health. Events: Events can be earned once you have the Events perk. You can usually have one event at a time, which you choose from three options. You power up an event by placing tiles of that color. Once its meter is full, you can call that event. There are tons on different events, and even more that you can unlock using keys. 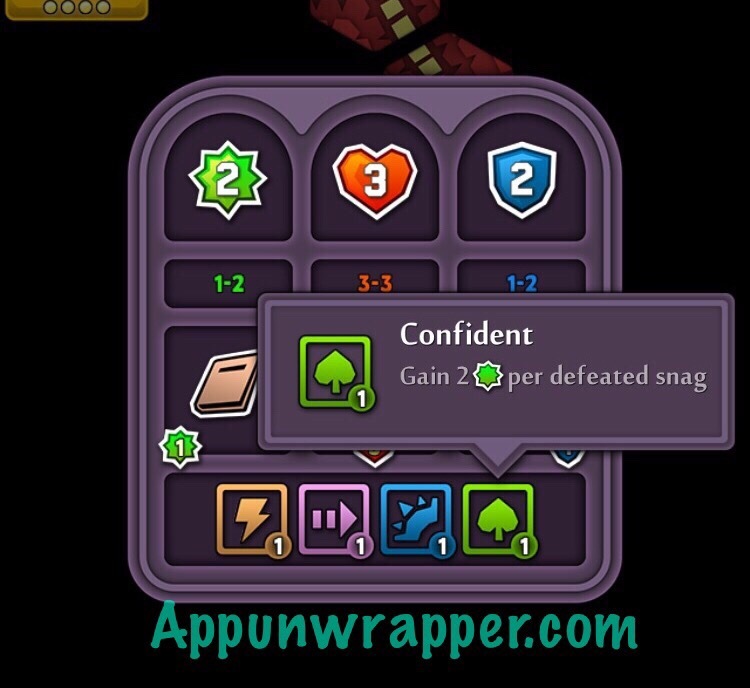 Discard Tiles: Tap the X in the upper right corner to discard a tile. Only attack/defense/heart/gear or basic Snag tiles can be discarded this way. This will also make the Nemesis move the same number of tiles as its level. Discarding a Snag tile will also give the Nemesis extra experience. • Try to level up your health early on. 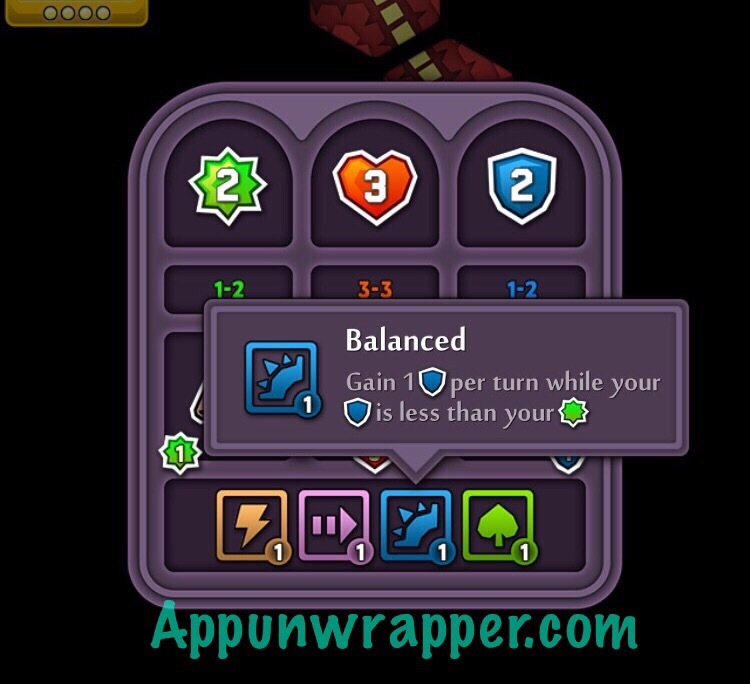 One level adds another 5 health to your original 10. • If you have some really bad Special Snags in your hand that you don’t want to have to place, try to hold off until you make it to the next floor. You’ll get a new set of tiles! Next PostDanger Dodgers Review: Whoosh! Tralalala! Wheeee! The first floor only needs two keys and then the exit. If you pick up too many keys, you could end up in a position where none of your cards fit on the exit.